WASHINGTON — Worried the US will not have a new heavy icebreaker in the Arctic for ten years, US Rep. Duncan Hunter is asking that Congress's next big appropriations bill temporarily bridge the "vessel gap" with a used model. In a Sept. 20 letter to House Republican leadership, Hunter, as chairman of the House Transportation and Infrastructure Coast Guard and Maritime Transportation Subcommittee, asked for extra money for the US Coast Guard to lease or buy a vessel while debate continues about building a new ship. Hunter claims the cost to charter an existing vessel, called the Aiviq, would be $33 million per year to lease and $150 million to buy. Built in Louisiana and completed in 2012, the Aiviq is not an icebreaker, but is a commercial ice-capable anchor handling ship owned by Louisiana-based Edison Chouest Offshore. The ship has been chartered by Royal Dutch Shell to support oil exploration and drilling in Alaska's Chukchi Sea. The Senate has appropriated $1 billion in 2017 for the acquisition of a heavy icebreaker, and Hunter said in the letter he was optimistic the Coast Guard would receive full funding. Hunter's idea is to pursue a block buy of at least two vessels and use the money as a "substantial down payment" to more rapidly design an icebreaker and buy lead materials. Whether or not the money is appropriated, the larger question of how committed the US is to building icebreakers will likely be an issue for the next administration to consider. The Obama administration, to assure maritime access to the Arctic, has been touting its request this year of $150 million from Congress to accelerate by two years planning and design activities necessary to "begin production activities" on a heavy icebreaker by 2020. Meanwhile, Hunter has called for the Coast Guard to buy medium icebreakers, with an option to lease, acknowledging the Coast Guard's formal requirement for three medium icebreakers and three heavy icebreakers. The Coast Guard, he said, had wrongly interpreted his proposal as a trade-off, with leased medium icebreakers supplanting the need for heavy icebreakers. 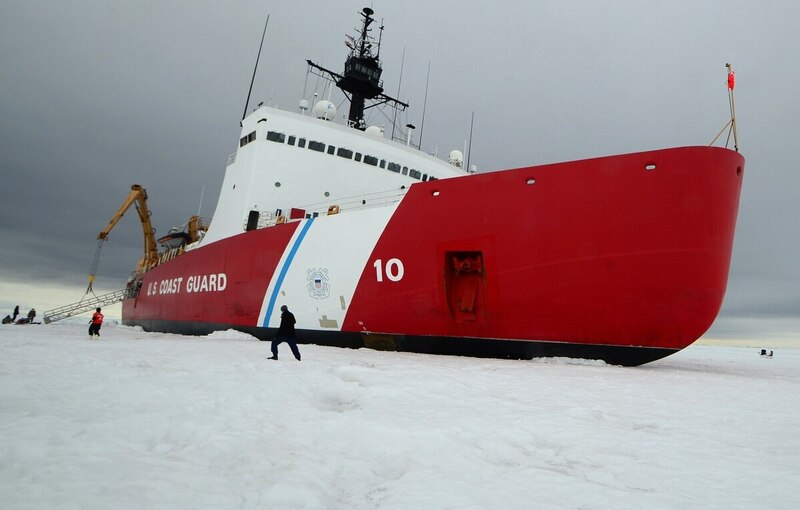 "It's my belief that the Coast Guard would benefit greatly from the initiative taken by Congress to provide funding—without drawing from existing Coast Guard priorities—to minimize the vessel gap, by leasing a medium icebreaker," Hunter said. Hunter’s letter asks House GOP leadership that funding be made available "in any suitable and forthcoming appropriations vehicle." An omnibus spending package or a series of "minibus" appropriations packages are in discussions for a potential deal in the lame-duck session. Though Hunter said internal Coast Guard guidance suggests commercial vessels can meet its icebreaking mission, Coast Guard officials have publicly resisted the idea of buying or leasing an existing heavy icebreaker. In testimony before Hunter's panel July 12, Adm. Charles Michel, vice commandant of the Coast Guard, repeatedly told lawmakers the Coast Guard has found no heavy icebreaker for purchase or lease that would meet its requirements — and that the Coast Guard does not operate nonmilitary vessels. The differences between lawmakers and Coast Guard on the issue led to a tense exchange in the July hearing between Rep. Don Young, R-Alaska, and Michel. Young urged Michel to consider the ice-capable Aiviq, which he said could be retrofitted in 12 to 18 months to "fill the gap." Coast Guard Commandant Adm. Paul Zukunft, Michel said, had visited the ship and found it "not suitable for military service without a substantial refit." When Young repeated the question and Michel replied similarly, Young told Hunter, "See, and that's what I call, mister chairman, a bullsh-t answer. Military service? I'm talking about moving ice." The Coast Guard's heavy icebreaker inventory consists of a single operational vessel, the Polar Star, which is 40 years old. Its other heavy icebreaker, the Polar Sea, is inactive. Lawmakers have expressed concerns the US will be overmatched in the Arctic by Russia's growing icebreaker fleet. While single-mission icebreakers built to commercial standards are available on the global market, the Coast Guard has not yet identified any available multi-mission, medium or heavy icebreakers suitable for military service, Michel told lawmakers. Michel noted that leasing a ship would cost more over a vessel's 30-year service career than buying the ship outright, adding that all Coast Guard vessels, whether purchased or leased, must be built in a US shipyard. Michel pushed back when Hunter questioned whether a nonmilitary vessel might be suitable. "This is not a pickup game for the Coast Guard," Michel said. "This vessel does not just break ice, just like the Polar Sea and Polar Star just do not break ice. Those are the assertion of national sovereignty through warships of the United States. Military vessels operated by an armed force of the United States, that's the Coast Guard." Christopher P. Cavas contributed to this report.